You want to see and hear narrative in its purest form? I’ve been saying for a couple of years now, “narrative is leadership.” Oprah just gave a textbook demonstration of this last night at the Golden Globes. Here’s my analysis. This is what leadership sounds like. THE ABT AT WORK. Oprah’s speech was a case study of how to deliver narrative structure. Narrative consists of 3 forces: Agreement, Contradiction, Consequence. The art of leadership is using them in the right measures, in the right places, and for the right durations. The ability to do this comes from having narrative intuition. 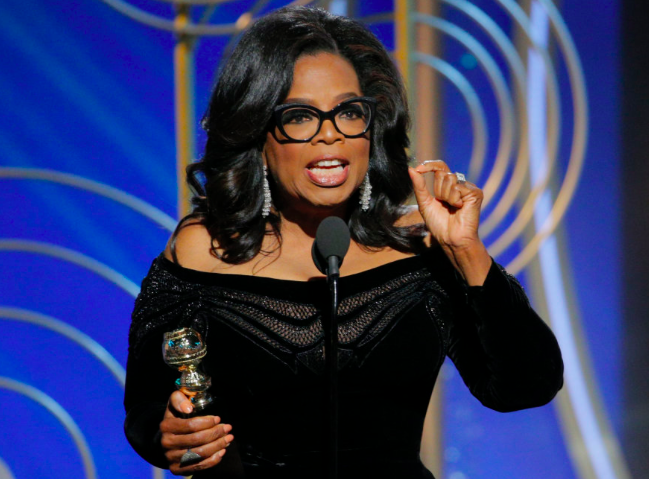 Have a look at Oprah’s instant classic speech from last night at the Golden Globes. The entire speech is solid “problem-solution” dynamics. No wallowing in accomplishments, no excessive congratulations, no silliness. And look how it finishes — with the dream for “that new day” — completely reminiscent of Martin Luther King, Jr’s “I Have A Dream” speech in which he outlined the journey we are on, proclaiming progress, but saying we’re not yet there — finishing by describing the dream for the future. This was a landmark speech, Oprah has deep narrative intuition, and the leadership skills — at least in communication dynamics — that our system selects for. To break it down I color code the three elements throughout the speech using BLUE (agreement), RED (contradiction) and GREEN (consequence).